We congratulate Michael McWilliams who has again been named a finalist in the Glover Prize and awarded the Children’s Choice Award 2016. It is the tenth time Michael has been selected in the competition to judge the best contemporary Tasmanian landscape painting, which he won back in 2004, the inaugural year of the prize. Michael has also been awarded the People’s Choice in 2015, 2014, 2012 and the Children’s Choice in 2013 and an Honourable Mention in 2008 and 2006. 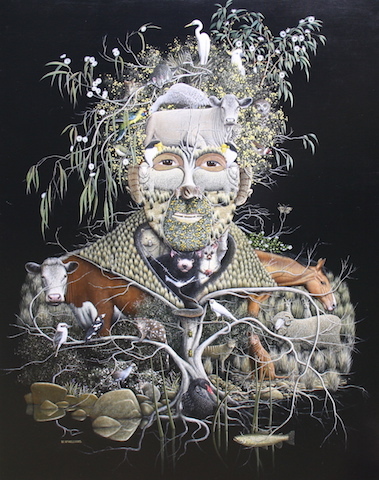 This year Michael has painted Portrait of a Landscape in the tradition of the witty and scientific fluency of the renaissance artist Guiseppe Arcimboldo. As ever with Michael’s oeuvre, the viewer is rewarded by looking closely to discover the serious environmental message beyond the gentle humour. We look forward to working with Michael towards an exhibition in 2018.